Freeze those thoughts about it being too hot in August in Vegas! Minus 5° Ice Experience at Mandalay Bay and at the Grand Canal Shoppes is a good place to go to freeze for a short period of time — It’s 23º inside — for a lot of money. Well, in all fairness, if you get a Groupon it is cheaper; otherwise, you are paying $45 per person to receive 1 drink coupon and a “fur” coat and gloves to use while in the “ice” room, which is a pretty small area, and a digital photo. And you actually can stay as long as you want; there is no time limit. If you want to wave the ice drink it is $17 per person for entry, coat and gloves. You can also spend $75 per person for their best package, which gives you 2 drinks, a 5×7 photo, a souvenir hat, and a koozie. Note: You are not allowed to take in your phone, cameras or electrical devices. They provide free lockers for your items and have a photographer available for photos you may purchase. 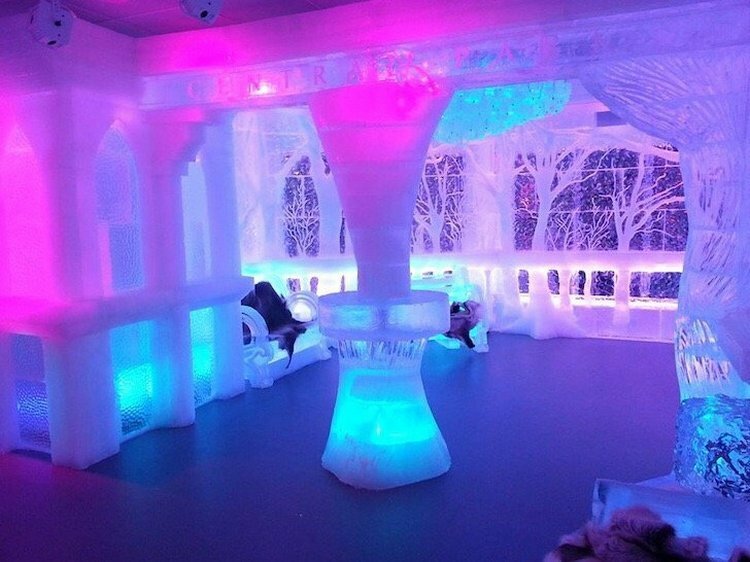 Everything inside the attraction is made of ice, including the walls, bar, seats, sculptures, and ice rooms. Your drinks will be served in ice glasses to add to the experience. 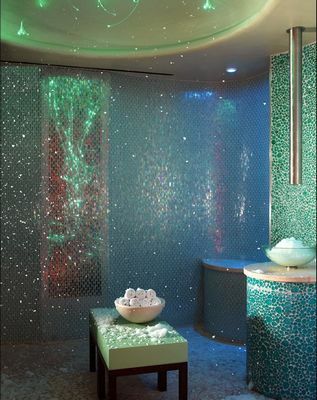 Qua Baths and Spa in Caesars Palace. Qua’s has an Arctic Ice Room where it actually snows! It is supposed to be the only one like it in the world. While I do not know if that is true, I do know that the 55 degree snow falling feels cold, once you finish with the spa jets and sauna! There is a wonderful scent of pine in the air which can evoke thoughts of a forest while the snow is falling. And you can sit on their heated benches and not freeze your toes on their heated floors while the snow hits you. Qua Baths and Spa has 3 Roman baths, a Tea Room and a dry heat sauna (Laconium room) where adults 18+ can relax with just about any facial or massage imaginable and destress. All of these rooms plus the Arctic Ice Room are included with the purchase of any treatment. Prices range from $50 for hotel guests, $55 for non-guests, to $65 on weekends for guests. If you are not looking to immerse yourself in the coolness, but, want to cool your innards you can go for the quick, easy and cheaper ice cream concoctions at various locations. 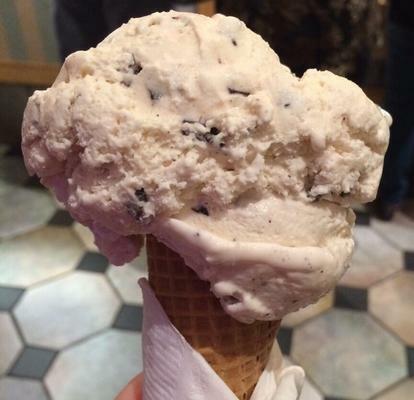 For something different while you are in the Grand Canal Shoppes, you can try Sloan’s Homemade Ice Cream. 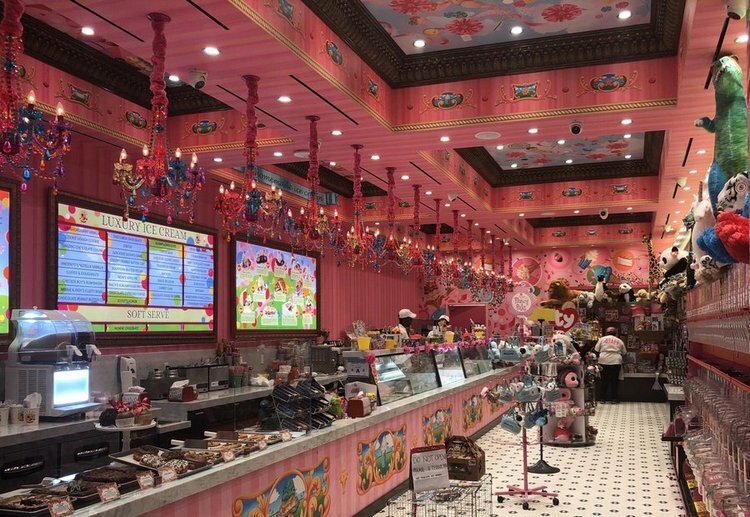 Mostly known for their locations in Florida and a few in California, Sloan’s has Tracy’s Kitchen Sink, which is 12 scoops of ice cream with all the toppings you can handle, served in an actual kitchen sink! You can also purchase scoops of Nutella vanilla, Tiramisu, S’mores, Mom’s Apple Pie, and Coffee & Donuts with Krispy Kreme glazed. This shop is so cute, and sells fudge, cake, cookies, caramel or dipped apples, dog treats, and candy. Lappert’s Ice Cream is located in the California Hotel Downtown. The company was established in 1983, and its manufacturing location is in California. They make over 200 flavors, with traditional and Hawaiian flavors, with huge portions. 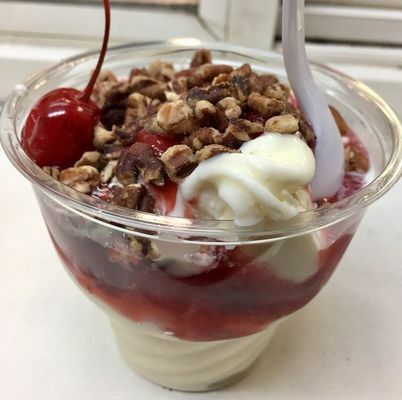 Some of their flavors include Lychee, Horchata Cajeta (rice cinnamon ice cream with Mexican caramel swirl), Coconut Pineapple, Kauai Pie (Kona Coffee with chocolate swirl, coconut & macadamia nuts), and Japanese Green Tea. They also have Hawaiian shaved ice, snacks, cookies, donuts, and other baked goods. 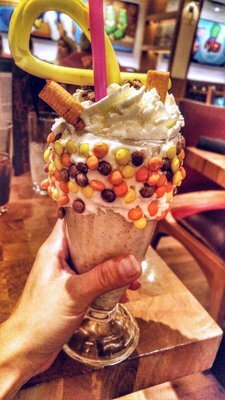 Sticks and Shakes has 4 locations around Las Vegas. They are at the Fashion Show Mall and Plaza, Galleria at Sunset Mall and in the Costco Plaza on North Decatur at 215, between Walgreens and Best Buy. The Shakes part of the title is obvious and includes over 100 selections, or they will make up your concoction if requested. 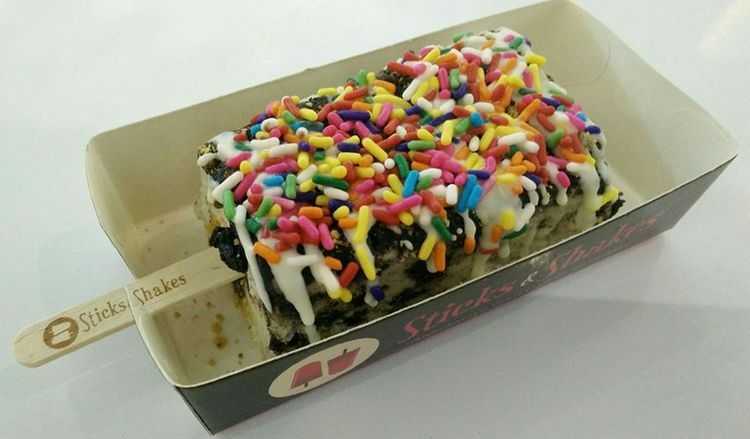 The Sticks is for their ice cream treats of fresh baked New York, Oreo or Strawberry cheesecakes on a stick and ice pops. They also have Frozen Bananas in white, milk or dark chocolate … yes, they are on a stick, and they have mini churro bites and chocolate covered strawberries. The Cosmopolitan’s Holsteins Shakes and Buns has adult and regular shakes. Obviously, the adult shakes which they call Bam-Boozled Shakes have liquor added and are $15 each. You have your choice of Campfire S-mores (graham cracker, marshmallow, vanilla frosting, s’mores candy stick and chocolate balls), Drunken Monkey (hazelnut, malt, banana, Reese’s peanut butter cups), Frozen Grasshopper (crème de menthe, peppermint meringue, peppermint patties), Donutella (Hazelnut and Nutella), and a few other choices. The regular shakes are $9-$12, including banana split, raspberry, vegan coconut, and the usual strawberry, vanilla and chocolate. They also serve complimentary popcorn, appetizers, salads, burgers, and specialized sodas including black cherry, ginger brew, sarsaparilla, and orange cream. Enjoy, enjoy! flavors of the day. Their flavors, which are hard packed (to go), include rum rainbow, mango, chocolate pretzel, Swiss almond, blue moon and malt crème. They open at 1 p.m. each day until 10 p.m. during the week and 11 p.m. on Friday and Saturday. Just a note for those of you who like to attend the Grapes & Hops Festival at the Springs Preserve. The tickets will be going on sale this month for the September 29th event. Ticket sales are capped at 2,000, so you should plan ahead to reserve yours this month. The festival includes unlimited wine, craft beer, food samples, and music. Proceeds from each ticket and the raffle and silent auction benefit Par for The Cure, a non-profit which raises funds for breast cancer research. Last year the tickets were $45 in advance or 2 for $80. Tickets usually sell out. Hoover Dam beginning to collapse in “San Andreas,” the 3D earthquake disaster movie featured in the Ultimate 4-D Experience at Excalibur Hotel. It’s hot and you want to escape the heat. There is no better way to do this than losing yourself inside a dark movie theatre, and Diamond Jack is suggesting the Ultimate 4-D Experience at Excalibur Hotel. The special effects theatre is family-friendly, with blockbuster content such as Man of Steel, San Andreas, and The LEGO Movie. Each 4-D Experience is approximately 15 minutes in length and presented in 3-D high definition projection. The visual experience is heightened by incorporating the latest technologies such as in-theater and in-seat effects to create the cinematic experience. The 72-seat theater opens daily at 10 a.m.
Now, the really nice weather comes to Las Vegas in late October, and here is a unique way to enjoy it: volunteer for the 2018 Shriners Hospitals for Children Open at TPC Summerlin from Oct. 29 — Nov. 4. Volunteer opportunities include standard bearers, caddie services, admissions, and walking scorers. Knowledge of golf is not required. Volunteers receive an invitation to the Volunteer Appreciation Party, a week-long tournament access badge, commemorative gift, meals during shifts, and a uniform including a tournament golf shirt, jacket and hat. www.shrinershospitalsopen.com/general-volunteer-information. 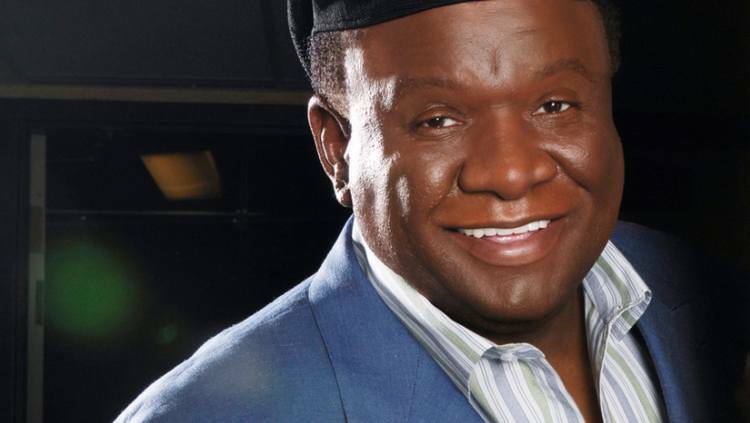 Wallace began his career as a writer for “The Redd Foxx Show.” The Las Vegas resident recently appeared in “Comedians in Cars Getting Coffee” with Jerry Seinfeld and will be appearing in the upcoming movie “The Last Laugh” alongside Richard Dreyfus and Chevy Chase. www.westgatelasvegas.com. Aribrator: A cook who leaves Arby’s to work at McDoanld’s. Heroes: What a guy does in a boat. 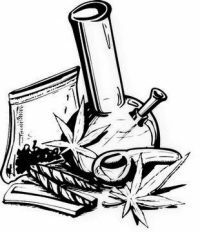 Nevada’s “Canna-versary,” the one-year mark since the sale of recreational cannabis was legalized, was celebrated on July 1. To celebrate, Cannabition — Las Vegas’ first and only immersive cannabis-themed museum will open Aug. 2 at Neonopolis. Cannabition will feature elaborate cannabis-inspired installations created by leading experiential art and exhibit designers. Visitors will be able to interact with monumental art pieces including a slide emptying into a pool of handmade foam “nugs” and at 23 feet, the world’s largest water pipe known as “Bongzilla.” There will be 10 educational and photogenic exhibits exploring the historic, botanical and lifestyle aspects of cannabis. With the Neon Museum garnering national and international attention, it has gotten to the point where visitors have been turned away because tours have been sold out. In response the museum is now offering self-guided tours with Historical Interpreters (guides) on hand to answer questions regarding the collection from 9 a.m. to 4 p.m. with a one-time admission of $19. There was a significant change made to peak-time nightly tours. Late night tours, previously available only on weekends, are now available seven nights a week. The last tour begins at midnight and finishes at 1 a.m. Hot Yoga has returned to the Neon Boneyard on Saturdays with an expanded schedule this summer. The cost is $18 with Neon Museum members receiving $8 off. Starting time is 4:30 p.m. for all sessions. 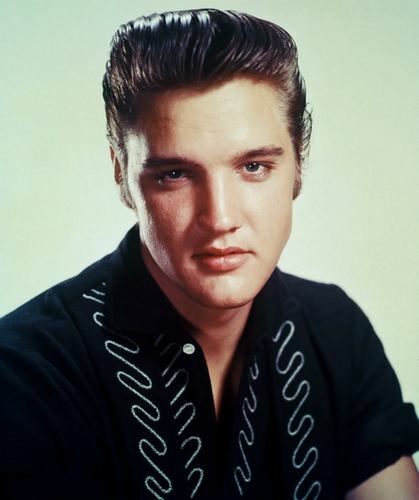 Elvis Presley’s star has been installed on the Electric Promenade donor’s walk, which leads from the distinctive La Concha visitor’s center to the main Neon Museum Boneyard. The star was originally part of the Las Vegas Walk of Stars in front of the now-demolished Riviera. When the Riviera’s sidewalk portion of the Las Vegas Walk of Stars was dismantled in early 2015, the Viva Las Vegas Club received possession of the Elvis star, which was slightly damaged. Club members decided to donate the original star to the Neon Museum, while a new star was created and reinstalled along the Walk of Stars. 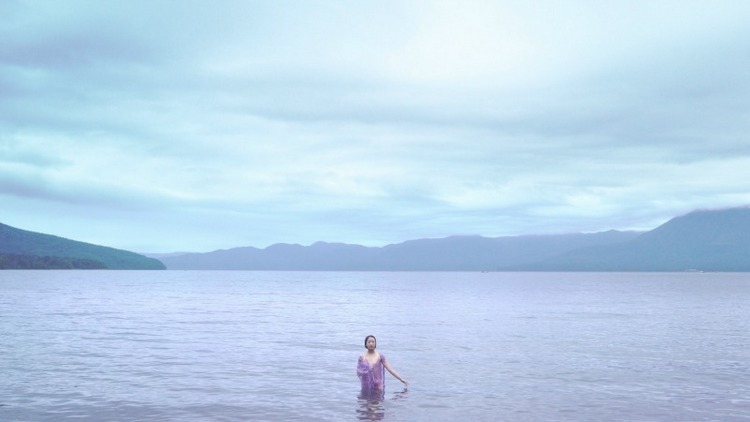 Primal Water: An Exhibition of Japanese Contemporary Art is the new exhibition with 28 works in various forms at the Bellagio Gallery of Fine Arts (BGFA) running this year through Oct. 21. The exhibit curated by Midori Nishizawa highlights important works of post-war Japanese art using water as a motif to present a view of Japanese Contemporary art history by 14 featured artists spanning four generations. The approach to the water theme by the artists takes a myriad of directions including waters absence, abundance, existence, and relationship with humanity. General admission is $14; check on discounts. Z’Cream Dream, available to the public through Aug. 31, is The Underground’s first “Zap-on-Tap” craft brew at the Mob Museum. House-brewed at The Underground’s new Prohibition exhibit featuring a distillery, brewery and speakeasy, Z’Cream Dream is a collaboration with signature sponsor Zappos. The next seasonal Zappos craft beer selection will be introduced on Sept. 1. Zappos has an in-house process for selecting a beer selection team each time, which meets with The Underground’s experts to create a different brew. Summertime Z’Cream Dream, a cream ale with subtle notes of sweet blood orange and the presence of vanilla, is available for $8 per pint glass. The Underground speakeasy, which opens daily at 9 a.m., is a full-service bar with a new Happy Hour from 5 to 7 p.m. Monday through Friday offering 20 percent off select cocktails, draft beer and wine by the glass. Admission to the speakeasy is included with the museum’s general admission, and free any time for patrons using the daily passwords found on Instagram Stories @MobMuseum Underground.